GRASS GIS is an open-source and free GIS solution that offers geospatial analysis and data management, maps and graphics production, image processing, visualization and spatial modeling capabilities. A project of OSGeo, the platform works well for academic institutes and various commercial settings around the globe. Environmental consulting companies and government agencies can also take advantage of the open-source software to analyze location-based data and manage it efficiently. The software is available for all major operating systems i.e. Windows, Linux and Mac OS. The platform is an official project by OSGeo (Open Source Geospatial Foundation) and is distributed under GNU GPL (General Public License) V2, which means that anyone is able to use the software and has access to the source code for further customization. The biggest advantage of GRASS GIS over other similar software is that it is open source and freely-available to users. It was originally developed by the US Army as a tool for environmental planning and land management. With the passage of time, the simple tool evolved into a multi-function software that offers a wide range of utilities useful for academic and scientific research institutes, government institutes, NGOs as well as commercial settings. The system is comprised of 350+ modules that allow users to render maps and images and manage location-based data. It can also be used for vector and raster data, multispectral image processing and spatial data creation, storage and manipulation. It supports both a graphical user interface and command line syntax and can interface with various printers, digitizers, plotters and databases. The software supports workgroups using the concept of mapset/location and is able to share data over the Network File System. Teams can also keep locations on a central server with underlying mapsets and work simultaneously in the same project DB. GRASS GIS offers powerful capabilities, including raster, 3D-raster (voxel), vector, DTM and point data analysis, image processing, geocoding, visualization, map creation, geostatistics, temporal framework, erosion modeling, landscapestructure analysis, watershed analysis and solution transport. The software also supports various database interfaces, including SQLite, DBF, PostgreSQL, ODBC and MySQL. The latest release of the software by default manages attributes in SQLite format and features a full temporal framework. If you are considering GRASS GIS it could also be beneficial to investigate other subcategories of Best Geographic Information Systems - GIS collected in our database of SaaS software reviews. Since each enterprise has unique business wants, it is prudent for them to abstain from searching for a one-size-fits-all faultless software system. Needless to say, it would be pointless to try to find such an app even among popular software solutions. The smart thing to do would be to jot down the various vital elements that require consideration such as key features, budget, skill levels of staff members, company size etc. Then, you should do your groundwork thoroughly. Read some GRASS GIS reviews and look into each of the other systems in your shortlist in detail. Such in-depth homework can ensure you discard ill-fitting platforms and zero in on the app that provides all the features you need for business success. How Much Does GRASS GIS Cost? 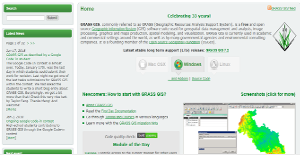 GRASS GIS is a free-to-use solution, and comes with no enterprise pricing fees to worry about. We realize that when you make a decision to buy Geographic Information Systems - GIS it’s important not only to see how experts evaluate it in their reviews, but also to find out if the real people and companies that buy it are actually satisfied with the product. That’s why we’ve created our behavior-based Customer Satisfaction Algorithm™ that gathers customer reviews, comments and GRASS GIS reviews across a wide range of social media sites. The data is then presented in an easy to digest form showing how many people had positive and negative experience with GRASS GIS. With that information at hand you should be equipped to make an informed buying decision that you won’t regret. What are GRASS GIS pricing details? What integrations are available for GRASS GIS? GRASS GIS offers several SQL integrations (SQLite, PostgreSQL, DBF, MySQL, ODBC). If you need more information about GRASS GIS or you simply have a question let us know what you need and we’ll forward your request directly to the vendor.